Here are sprites for me in space and for my other online name, monkey_puma. Also, I've updated the last set of sprites for the last tme, so you can go look at them again and see me *dun dun daa* sitting! EDIT: Just like my first post, I've removed something. You don't need the Spaceman Phil sprites that were here, because there are more complete Spaceman Phil sprites here, farther on in the thread, like page eleven farther on. Sorry about how rambling that link is, but I must make it big so that folks are less likely to miss it. If I just put "Find them here, " then I know people would miss it. Last edited by phil_mike; 06-04-2005 at 02:00 AM. All in all, I think it came out pretty good, consitering this was my first time editing sprites on MS Paint (though I have had a lot of practice thanks to many years of Mario Paint). I though the shotgun was a nice touch as well (especially using it as a melee weapon). I'll probably update him into 16 bits in the eventuality (i.e. when I feel like it (that is to say, probably in a year or so (not that you care (not to assume that you would not care)))). I know... the excessive use of parenteses is not funny... Nonetheless - meh. Last edited by ApathyMan; 02-04-2005 at 11:52 PM. At last! The Spirit Sprites are complete! I have finally finished the sprite. 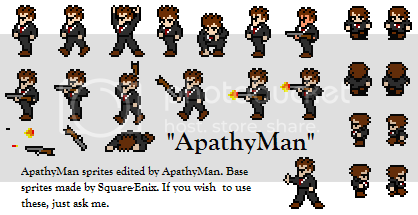 Mad props to Stephanos, without him this sprite work would have been impossible, although these are just preliminary sprites I still hope that they may get used (just ask first.) Also if anyone has anything they could do with it please let me know. Also if someone could make all the sprites as big as the one in the corner that would be awesome. "Revenge is a dish best sereved cold. And it is very cold in outer space"
Last edited by TheSpiritOfVengance; 02-06-2005 at 03:00 PM. This is the sum total of the work I've done so far... in my free time yesterday. And it made me realize something, I'd kill for a program better than paint. But since I have no connections or moneys, I'm stuck. This is the culmination of my inexperience with spriting, my crappy program, and, of course, my lack of free time. Enjoy and make any sugestions you can. More coming when I get the time. EDIT: Yeah, they're small but that can't be helped because of lack of a useful resizing tool. Last edited by The Kneumatic Pnight; 02-06-2005 at 11:02 PM. not exactly what I was looking for, but it was what I needed, and you did do the hardest part. it isn't showing up for whatever reason. The Power of Cheese Compells You! :bmage: I'm of to nuke the Fighter! The stupid Fighter of OZ! Last edited by Black-Mage's-bro; 04-03-2005 at 06:57 PM. If the female Red Mage is anything but your forum character/avatar, please delete that post. This thread is for forum character sprite sheets only. But you do know that the whole purpose of this thread is to make all the sprites freely available so people don't have to ask for them when they want to feature another member in a forum comic? If you don't want people using your sprites without asking, post them somewhere else. Also, do us all a favour and tone down the aggressiveness. No one's impressed. The server time is now 10:44:19 PM.